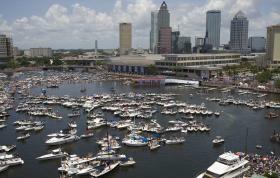 Red Bull Flugtag Tampa Bay Breaks Records! In case you missed all of the action this past weekend, Red Bull Flugtag Tampa Bay broke records for a Flugtag event in the United States! In addition to 36 crazy teams attempting to fly homemade, human-powered flying machines, approximately 110,000 people filled the sidewalks, balconies and waterways in and around the Tampa Convention Center. If you were there at the beginning, then you saw the winning team! It was the first craft of the day, local team Tampa Baywatch, that took home top prize with their hotter-than-“The Hoff” skit and a flight distance of 109 feet. If you weren’t able to make it out, visit this link to see a first-hand experience of Flugtag Tampa Bay, and take a tour through this crazy event! If you were able to make it out, let us know what you thought! Post your comments and share your crazy stories from the event.